I’m Done Freaking Out. Lets go! As the wedding season slows a bit here in the south (it gets really hot here), I find I’m able to catch up on the things I’ve been meaning to get to for a long time. I no longer feel like I’ve got all the unedited files snapping at my heels like a herd of badly color corrected schnauzers. 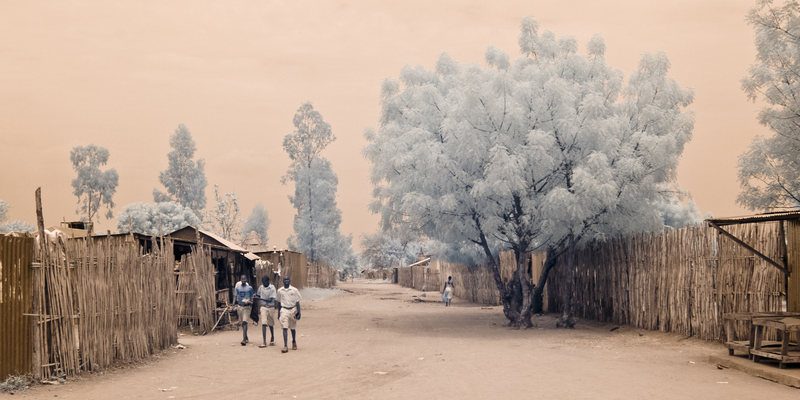 On one of my previous trips to Africa, before I left, I had my old 30d slr camera converted to shoot 720 nm infrared light by Digital Silver Imaging. They take the old filter that’s opaque to infrared light off your sensor and replace it with one that allows certain wavelengths of infrared light to pass through. This allows for some really unique photography. I’ll say right off the bat that people seem to either hate it or love it, but it is a totally different way of seeing things. Objects reflect infrared light differently than visible, light, so the processing of the photographs is really an art form unto itself. So why would I carry the extra weight of an additional camera body when I have tight weight restrictions and literally need to be able to carry everything on my back? Because as far as I know, nobody’s done it before, at least not in South Sudan. All photos were taken either in South Sudan or in Kenya. I wanted to get a new perspective, and by doing so, perhaps catch peoples attention who have never paid any notice to what’s going on in that part of the world. As I’ve mentioned in previous blog posts, there is a tremendous physical and spiritual need in South Sudan. Having said that though, I’m not sure I’d carry the extra weight again. A family shelters from the heat of the day in Torit, South Sudan. 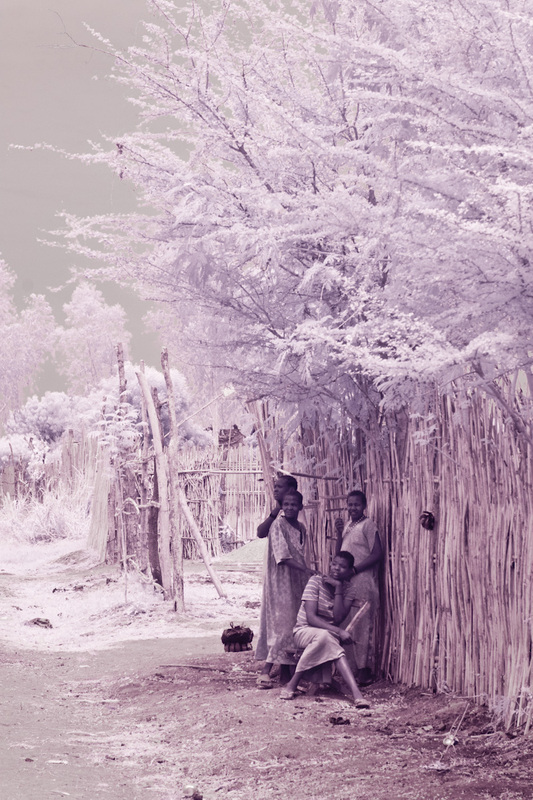 Infrared photo. Enjoy my photography, and if you’d like to own some of it, you’ll be helping a good cause. 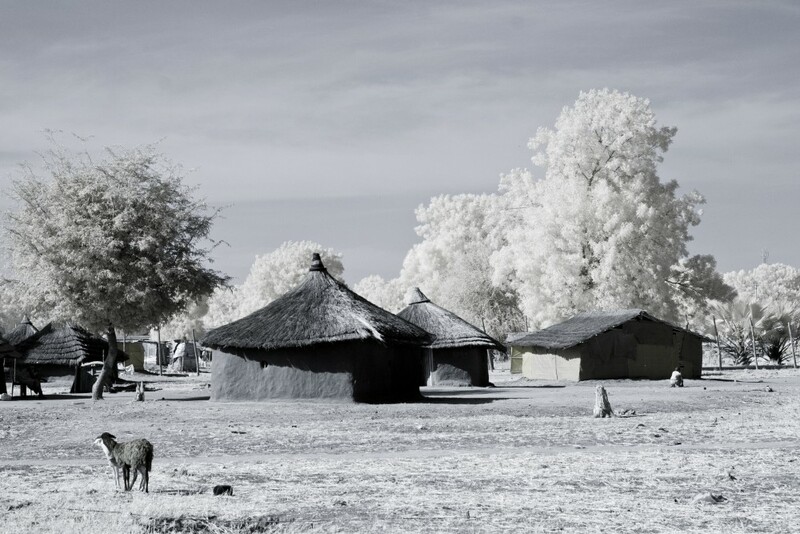 Huts and one lone sheep, Bor South Sudan. Infrared photo.